E3 News: Forza Horizon 4 Ultimate Edition – Xbox One Release Date, Pre-orders LIVE and In Stock! Pre-orders for the highly anticipated release of Forza Horizon 4 Ultimate Edition – Xbox One are LIVE at Amazon! 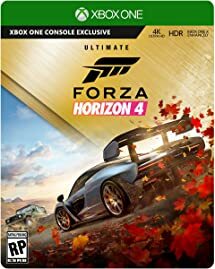 The Forza Horizon 4 Ultimate Edition bundle includes:* Forza Horizon 4 game disc, early access, allowing you to play four days early beginning September 28th, Forza Horizon 4 Car Pass, VIP Membership, Day One Car Pack, and two game expansions when they become available. SEASONS CHANGE EVERYTHING. For the first time in the racing and driving genre, experience dynamic seasons in a shared open-world. Explore beautiful scenery, collect over 450 cars, and become a Horizon Superstar in historic Britain. (Some cars provided by online update. Britain Like You’ve Never Seen it. Discover lakes, valleys, castles, and breathtaking scenery all in spectacular native 4K and HDR on Xbox One X and Windows 10. Master Driving in All Seasons. Explore a changing world through dry, wet, muddy, snowy, and icy conditions. New Content Every Week. Every week, a new season change brings new themed content, gameplay, challenges, and rewards. Go it Alone or Team Up. Play solo or cooperatively. Join Team multiplayer for casual fun or Ranked Teams to take on the best in the world. Xbox Live Gold (sold separately) required for online multiplayer on Xbox consoles. Forza Horizon 4 Ultimate Edition – Xbox One has a scheduled release date of October 2, 2018. Previous PostPrevious E3 News: Rage 2 Collectors Edition PS4 Xbox One Pre-orders LIVE, In Stock! Next PostNext E3 News: Tales of Vesperia Pre-orders LIVE on Nintendo Switch, PS4!